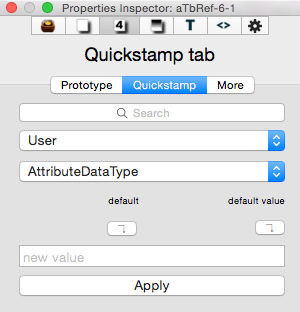 The Quickstamp tab allows you to set a single attribute's value on one or more currently selected notes. It remembers the last used settings during the current session (i.e. until the TBX is next closed). Search box. This allows the user to start typing an attribute name that Tinderbox will attempt to auto-match, suggesting completions. If an item is matched (or clicked form the suggested match list), the tab will select the appropriate Group and Attribute names to populate the other controls. From v6.5.0 this box has focus when the dialog is opened via keyboard shortcut (Cmd+2). Category. This allows the user to select a name from a list of any of the defined groups of Tinderbox pre-defined System attributes. Attribute. This allows the user to select an individual attribute's data from the currently selected group (above). Read-only attributes as shown in italics. They can be selected, so their values can be viewed, but the cannot be edited. Inherited value, or 'default' if no prototype set. The value shown is the value to be inherited if different from the local value. Click the button to apply this value/inheritance to the current selection, and (re-)set inheritance. Value assigned (locally) to this note, or 'default' if no prototype set. The value shown is the value to be inherited if different from the local value. Click the button to re-apply this value to the current selection. Generally, if re-setting inheritance, use the left button. Input box. A box for setting a local value for the selected attribute, for the current note selection. Apply button. Applies the Value box value to the selected item(s). With very large selections this may take a few seconds. Using the Return key acts as if clicking this button.